Recombinant full length protein corresponding to Human SYT6 aa 85-510. Our Abpromise guarantee covers the use of ab24250 in the following tested applications. WB: 1/2000. Predicted molecular weight: 57 kDa. 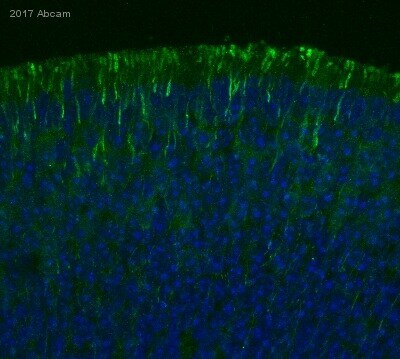 This antibody gave a positive result in Western blot against the immunising peptide (ab24250). May be involved in Ca(2+)-dependent exocytosis of secretory vesicles through Ca(2+) and phospholipid binding to the C2 domain or may serve as Ca(2+) sensors in the process of vesicular trafficking and exocytosis. May mediate Ca(2+)-regulation of exocytosis in acrosomal reaction in sperm. Cytoplasmic vesicle > secretory vesicle > synaptic vesicle membrane. Lane 1 : SH-SY5Y cell lysate. Lane 2 : Mouse liver tissue. N.S: Nonspecific band. Molecular weight marker from NEB (#7708). Publishing research using ab24250? Please let us know so that we can cite the reference in this datasheet.